A center for Latino art and culture located in downtown Phoenix creates its own world for visitors to enjoy art, entertainment, dancing, workshops and above all, culture. The Arizona Latino Art and Cultural Center, on Adams and Second streets, houses an art gallery, a gift shop and a performance area. Galeria 147, the name of the art gallery, sprawls across three rooms, each dedicated to different themed shows or artists. The center sits across the street from the Phoenix Convention Center and in comparison looks deceptively small. In reality, the center is approximately 5,000 square feet, which accommodates private art studios and offices for numerous artists who volunteer or showcase their artwork at the gallery. The center was founded in December 2009 when a group of people recognized that Phoenix was lacking a Latino cultural center. Mendia learned of the aspirations of the group and began volunteering in the months approaching the grand opening. “I was so impressed with the vision of this project that I remained throughout the last several months, which is about 12 or 13 months,” said Mendia. The center is currently hosting an exhibit showcasing the journeys of Cuban artists. “The Dream And The Time II” features 50 Cuban artists and will be open until April 30. 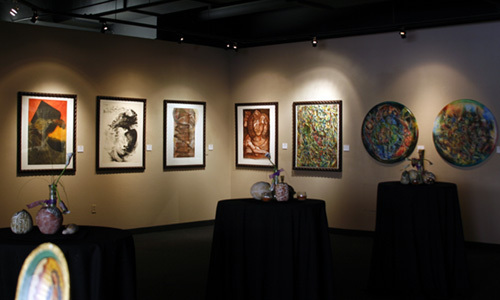 The opening reception for the exhibit was held in early March and featured Cuban festivities, food, live music and art. The center is also currently featuring an exhibit by Carlos Rivas, a local artist who also volunteers at the center. Rivas discovered the center while walking through downtown Phoenix taking photographs and has been volunteering at the center ever since. The center hosts several other events and receptions throughout the year that feature art, music, dance, film and theatre. “It’s almost like Disneylandia,” said Mendia. Recently, George Yepes, a renowned artist who has been featured in over 30 museums across the country, and Gennaro Garcia, a prominent artist from the southwest, completed a two-man show. Christopher Plentywombs, an 18-year-old Native American artist, created an exhibit of dresses made from newspapers that can be worn. The center hosted an event where models showcased Plentywomb’s fashionable art. Another prominent exhibit at the center was “SB 1070 – An Artist’s Point of View.” A group of local artists put together the 30 piece show expressing their thoughts on the controversial law. The center also devoted a hallway in the gallery for the public, who were encouraged to create their own art or express their own opinions on SB 1070 on the walls. “We’re a non-partisan organization, and so we try to be very open to all issues and different points of view,” Mendia said. The center has also held a Latina Author Night, an exhibit by Latino Native American veterans and an exhibit honoring the virgin of Guadalupe. In addition to preparing the gallery, which had no lighting, the volunteers had to curate a 30 piece show featuring Arizona Latino artists. Somehow, the volunteers managed to do it. Volunteers and donors have been a vital aspect in helping the center grow and expand, Mendia said. Target executives, for example, saw a list of the center’s needs in the days approaching it’s opening and donated everything on the list. Mendia, who worked as a teacher for several years, has been active in expanding the educational and community outreach of the center. The center has hosted educational workshops for elementary schools and hopes to do similar activities in the future. Artwork from the center is currently being exhibited in buildings on ASU’s downtown campus. In October, November and December, the center will host three Native American artists from Mexico. Each artist will hold workshops and presentations for the public and students. This program is “phase two” for the center, which includes, among other things, an emphasis on education. The center also hopes to put on a Colombian show. Exhibits at the gallery are not exclusively traditional Latino art. The center showcases new-aged art with little Latino influence. Also, several non-Hispanic artists exhibit traditional Latino art. All of the exhibits in the gallery are for sale. Profits from the exhibits benefit the center, Advocates for Latino Arts and Culture and the individual artists. The center encourages ASU students to attend receptions and events. Student membership for the center costs $10 a year, which qualifies students to attend special events and to exhibit artwork. General membership for artists and the public costs $25 a year. The center also rents out it’s facilities for events and meetings. The sense of spirit and culture that other locales lack is provided by the center as companies can also take advantage of the featured performing artists. Mendia believes both ASU students and the general public would enjoy the many activities the Arizona Latino Art and Cultural Center offers. “We’re open to everybody who would like to celebrate Latino culture and it’s many facets,” Mendia said. Contact the reporter at eeeaton@asu.edu. Posted on March 30, 2011, in Arts and Culture, Downtown Vitality and tagged Arizona Latino Art And Cultural Center, Downtown Phoenix, Galeria 147, Mario Mendia. Bookmark the permalink. Leave a comment.